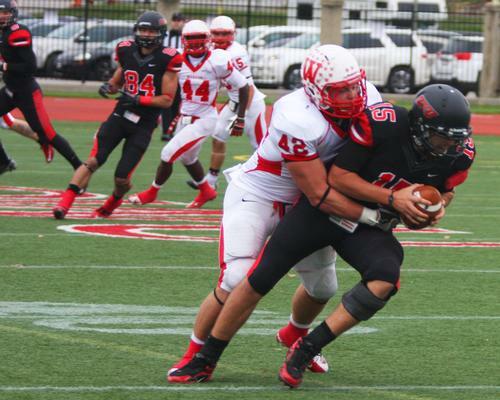 For the second week in a row, the Wabash Little Giant defense blanked its opponent. 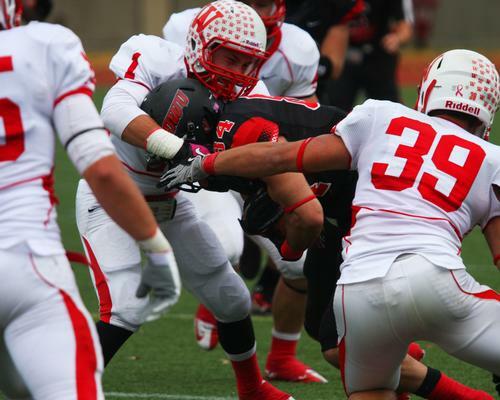 The Little Giants held Ohio Wesleyan scoreless in a 28-0 victory. 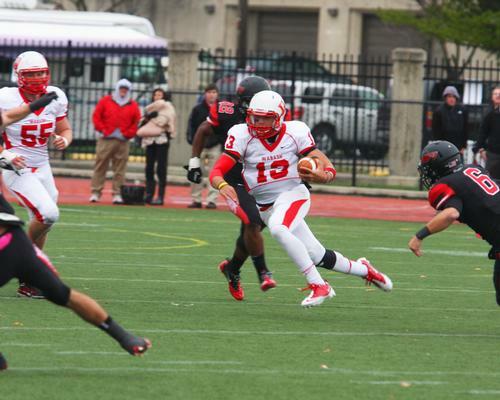 The score was tied 0-0 at halftime, but the Wabash offense scored 4 second-half touchdowns in a game that will go a long way in deciding the 2012 NCAC Champion. 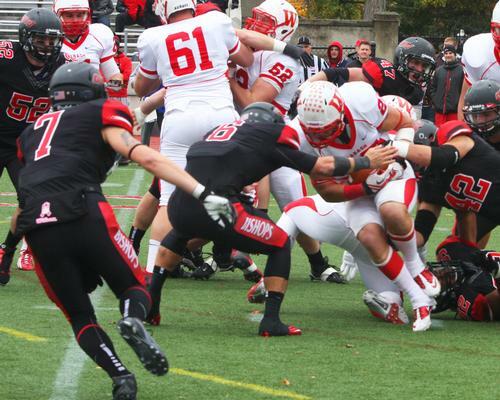 The Bishops were knocking on the door on the opening drive of the game but running back Scott Jenkins was stuffed by the Little Giant defense on a fourth-down plunge from the one-inch line. 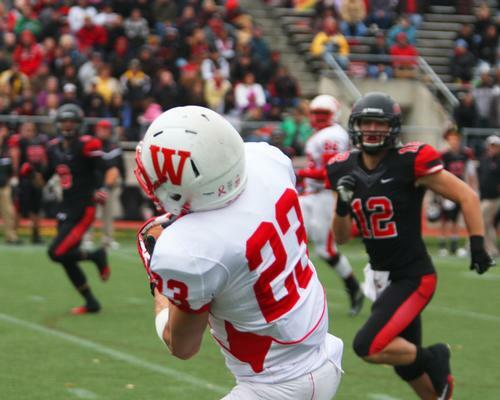 Wabash’s offense took the ball in the shadow of its own goal post but was unable to make much happen. Poor field position and not sustaining drives were common themes for the Little Giant offense in the first half. However, it broke the game open after halftime, led by Chase Belton and Tyler Holmes. 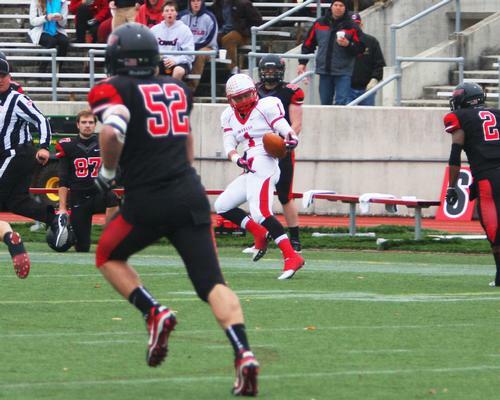 Holmes one-upped himself to set a new personal best with 210 yards rushing a week after posting 189 last week. 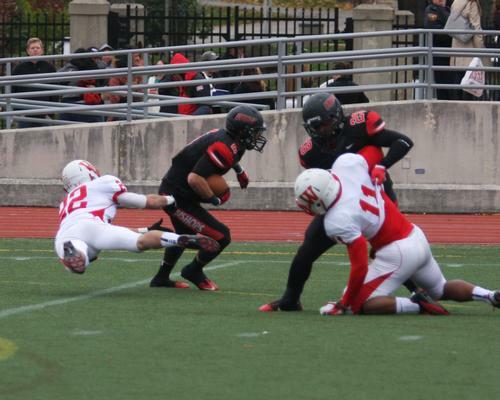 He added a touchdown on a career-long 67-yard scamper with 23 carries for the day. After last week’s 30-0 victory over Wooster, the Little Giant defense forced a shutout in back-to-back games for the first time since 1983. Today’s achievement was not as easy as the score may suggest. 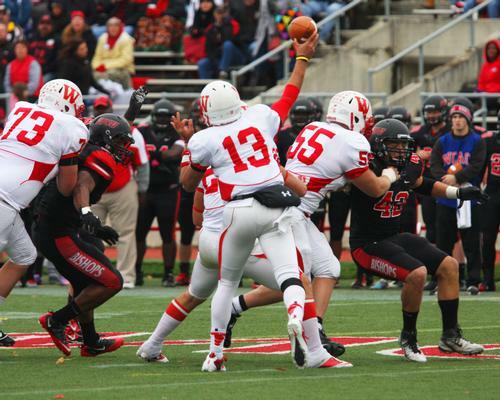 Ohio Wesleyan quarterback Mason Espinosa completed 52 passes of an astronomical 75 attempts. He gained 428 yards through the air without a single completion going for more than 25 yards. 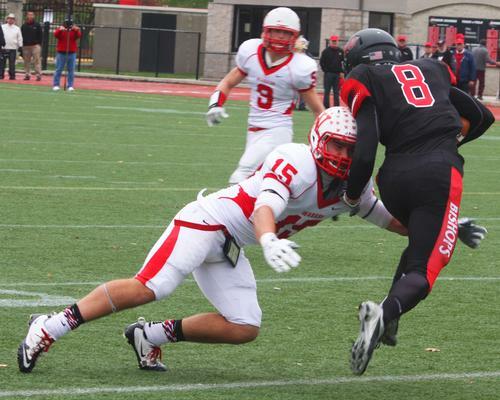 The dink-and-dunk offense moved the ball until it approached the red zone, where the passing windows were tighter and Wabash defenders made plays. Buresh was one of four Little Giants to record 10 or more tackles. Justin Woods led the unit with 16 stops, including 12 solos. Denzel Wilkins added 13, while Nate Scola finished with 10. 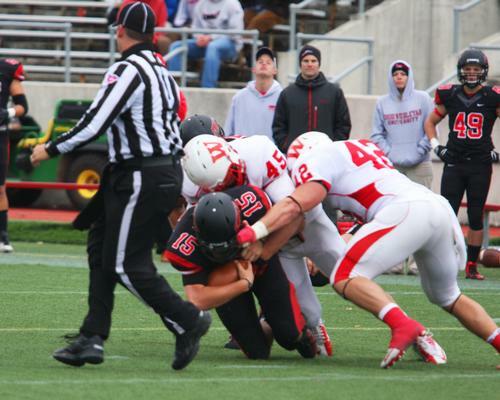 Scola added a team-high 3 tackles for losses and made 1-1/2 sacks. 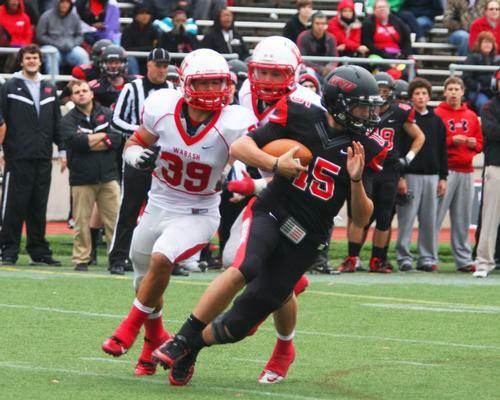 Wabash sacked Espinosa 6 times throughout the game, adding to the negative rushing totals for the Bishops. 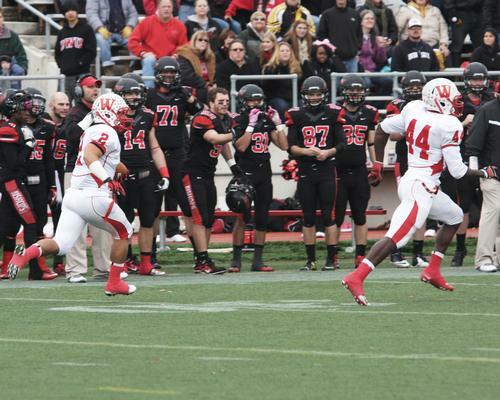 OWU finished the contest with minus-22 yards rushing. Zach Breuckman made two sacks, with Tyler McCullen finishing with 1-1/2. Pat Clegg recorded the final sack. 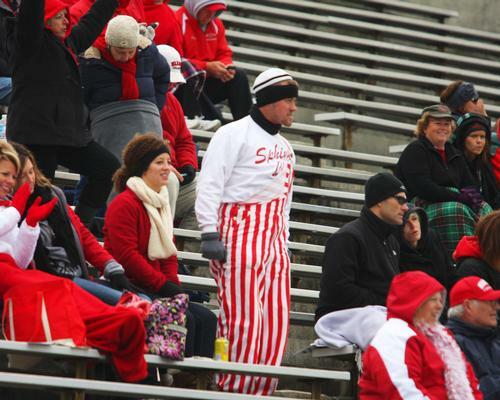 After stalling out in Wabash territory twice in the first half, the Bishops tried to put points on the board with two field-goal attempts. 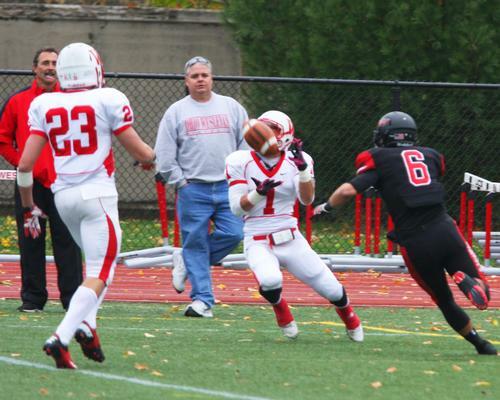 The first try sailed wide right from 41 yards out while Buresh swatted the second. The 0-0 deadlock ended in the third quarter when Belton lofted a deep pass down the right sideline to Houston Hodges for an 82-yard strike. The starting corner and wide receiver would later add another touchdown catch --- this time for 26 yards --- and an interception. Two series later, Belton found Sean Hildebrand on the same play, except this time down the left sideline for a 71-yard score and 14-0 lead. 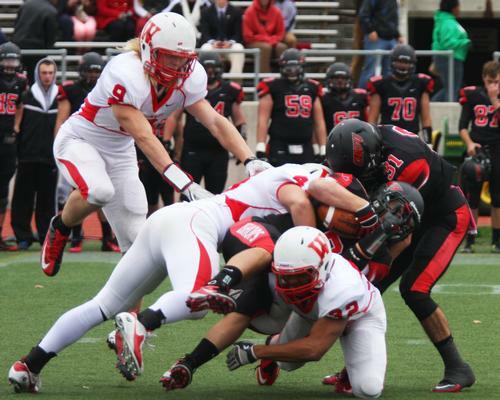 Huddleston, a two-time All-Conference defensive end for OWU, made his presence known with 2 sacks. 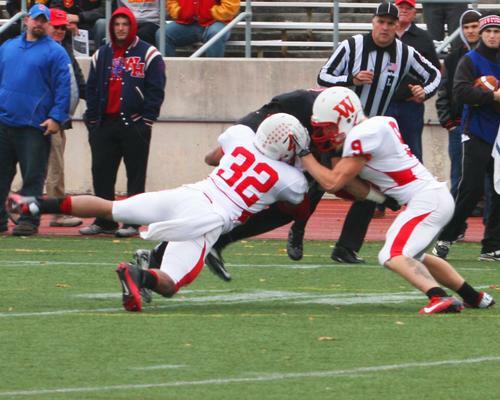 Despite Huddleston’s disruptiveness, Raeburn knew the offense had to loosen up the defense with big pass plays. Once the defense softened up, Holmes and the Little Giant offensive line went to work wearing down the Bishop’s front seven. The group muscled open big holes on a 67-yard touchdown run by Holmes. On the next drive, Belton found Hodges again, this time on a 26-yard touchdown pass for the game’s final score. 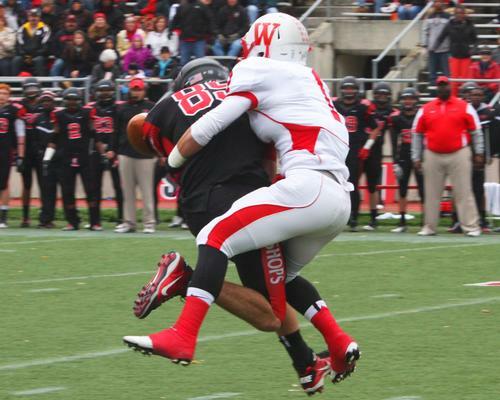 Wabash will still need some help to win a second-consecutive NCAC Championship. 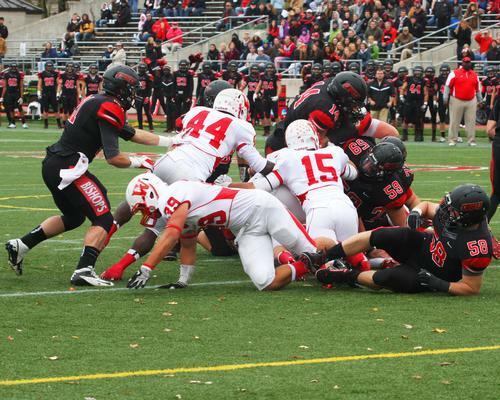 All the team can do is win its final two games, starting on Senior Day Saturday November 3rd against Oberlin College. The Little Giants will remain home the next week when they host Depauw in the 119th Monon Bell Classic.